The Hylands Tunable Practice Chanter is very much like most other practice chanters except it has the unique feature of a threaded tunable section. This allows quick easy tuning adjustments at any time without reed manipulation. This feature is very convenient when playing together with a tutor or a recording and especially in a group situation like a band chanter practice. As well as the ability to easily tune, the Hylands Tunable Practice Chanter also has a few other features which set it apart from most other practice chanters. 1. The holes on the practice chanter are consistent with the spacing on most pipe chanters and are countersunk to give a good feel whilst playing. 2. The Screw-in Mouthpiece is reverse threaded. This means that the mouthpiece screws into the Top Section rather than on to it. This ensures that in the case of an unfortunate breakage, the mouthpiece needs only to be replaced rather than the whole Top Section. 3. The Ferrule and Mouthpiece Ring are made from Stainless Steel so they retain their new look and are simply cleaned using a soft cloth. 4. The Reed Seat is threaded to allow for easy adjustment and ensure the reed doesn't fall out. 5. 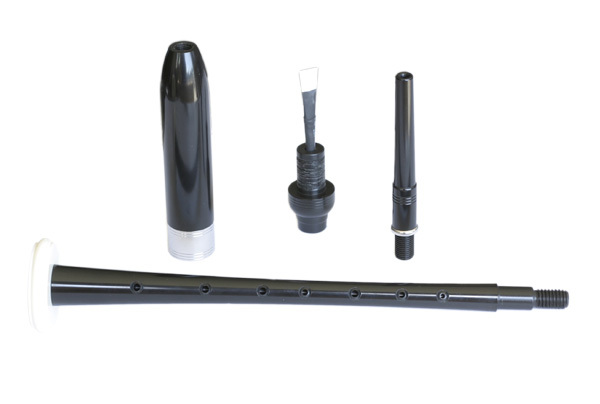 The black plastic used in the manufacture of the practice chanter is polished to a high gloss to give a very classy finished product. Top Section with Screw-in Mouthpiece. Bottom Section with Imitation Ivory Sole. 1. Screw the Bottom Section fully into the Mid Section. 2. Then unscrew the Bottom Section ONE FULL TURN out from the Mid Section. This will allow scope to tune the practice chanter quickly and easily at any time once the reed is at the required setting. 3. Insert the reed into the threaded reed seat and set the reed to achieve the sound and pitch that you require. The reed can be raised in pitch by turning it clockwise into the reed seat or lowered in pitch by turning it anti-clockwise out of the reed seat. 4. The practice chanter is now set up to play. A pitch adjustment can now be made at any time by simply screwing the Bottom Section into or out of the Mid Section. To raise the pitch simply screw the Bottom Section clockwise into the Mid Section. To lower the pitch simply unscrew the Bottom Section anti-clockwise out of the Mid Section. 1. When cleaning the practice chanter it is important to ensure that all 3 sections are carefully taken apart and the reed is protected from any damage. 2. Take the Top Section off. Unscrew the reed carefully, take it out and set it aside until you are ready to put the practice chanter back together. 3. Unscrew the Bottom Section from the Mid Section. 4. Simply pull through the bores of the practice chanter using a thin cloth or soft brush. This will remove any build-up. 5. Rinse the sections through under a tap with warm water then dry off thoroughly with a soft towel. 6. Put the practice chanter sections all back together, insert the reed and reset. If at any time, you have a question about the Hylands Tunable Practice Chanter or need some technical support then please do not hesitate to email us and we will be happy to assist.